Marshy ponds, lakes, slow streams, and bogs. This is a small skimmer, 15 ⁄16″ to 17 ⁄16″ long. 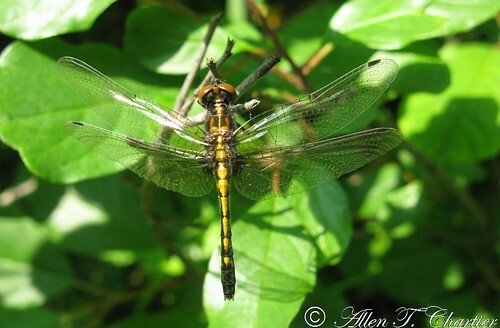 The male has a white face, black thorax, black abdomen, and clear wings. There is a single, squarish, yellow spot on the top (dorsal surface) of segment 7 of the abdomen. The thorax is black. The face is white. 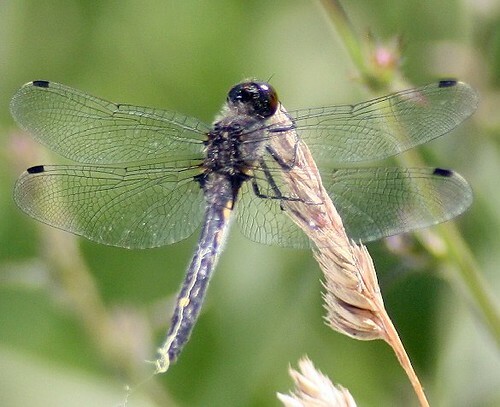 The wings are clear except for a small dark patch at the base of the hindwings and the stigma at the leading edge of each wing. The female and the juvenile are more colorful. There is a single dorsal yellow spot on segments 2 through 6. The spot extends nearly the length of the segment. There is also a squarish, yellow, dorsal spot on segment 7, and yellow stripes on the side (lateral surface) of segments 4 and 5. As the female matures the dorsal spots on segments 2 through 6 fade. The lateral stripes often fade as well, though they last longer than the dorsal spots. The dorsal spot on segment 7 does not fade. With the faded spots an older female looks much like a male, but it rarely becomes as dark as the male. About 18% of the females have a conspicuous amber patch on the basal 20% of the wing (where the wing attaches to the thorax). Hudsonian whiteface (Leucorrhinia hudsonica) is slightly smaller. Juveniles have a triangular, not squarish, spot on segment 7 of the abdomen. Mayfly naiads, mosquito larvae, other aquatic fly larvae, freshwater shrimp, small fish, and tadpoles. The female hovers just above the surface of shallow water near aquatic plants that touch the water surface. She dips the tip of her abdomen into the water to deposit the eggs. The male guards the female as she deposits her eggs. The naiads live in submerged vegetation. They emerge as adults at night. Adults perch horizontally on the ground and on floating vegetation, especially water lilies. They hunt from shoreline vegetation. I almost bypassed this small dragonfly until I got closer and noticed not only why it got the name Dot-tailed Whiteface, but that it also made some interesting head movements at times. Photographed at Fisher, Minnesota (17 June 2011). Thank you to DeeDee (@Bugguide.net) for confirming the identity of this specimen! Photographed at Fisher, Minnesota (28 May 2012).